This update is going to be more of a dev blog than a normal update, since we do have quite a lot of things to show and talk about. Let’s start with talking about kickstarter and the possibility of ground combat to begin with. We’re working towards a kickstarter right now, which we want to launch some time in the next few month, and sooner rather than later, and we’ve already begun planning the kickstarter campaign. It’s pretty much standard practice to specify stretch goals beyond the main funding goal, which usually are major features in addition to the basic game. One such stretch goal would be ground combat, since it’s not crucial to the game, but would make it a lot more interesting. But it does add another 2-3 months of development time, and we really don’t want to blow up the initial funding goal. 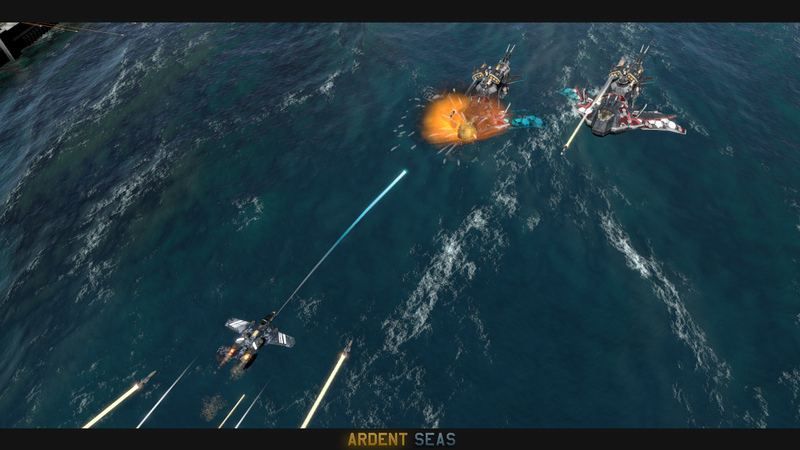 The main purpose of ground combat is to add extra depth to the gameplay, and making the capture and defense of the various islands much more interesting, compared to parking a command ship in the harbor and letting it run down the cap timer. 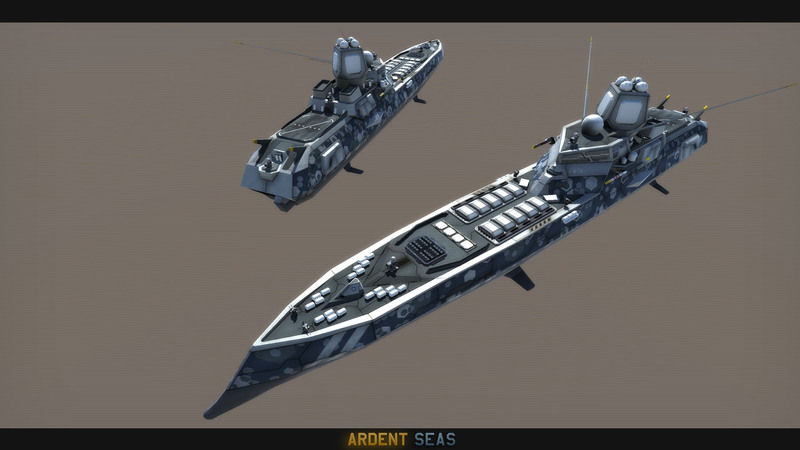 As with the naval part, the factions wouldn’t be mirrors of each other, but generally speaking, each faction would get a landing craft of some kind, an assault unit, and artillery, a tank destroyer, an anti-aircraft unit, a special unit, like a mammoth tank for example, and a support unit, like a mobile repair vehicle. As well as a mobile command post, which would be the main objective on an island. If there is no enemy MCP on an island, you can just drive yours into position, and deploy it. The island will then be captured as soon as it’s deployed. If there is an enemy MCP, you will have to destroy it, and then place your own. 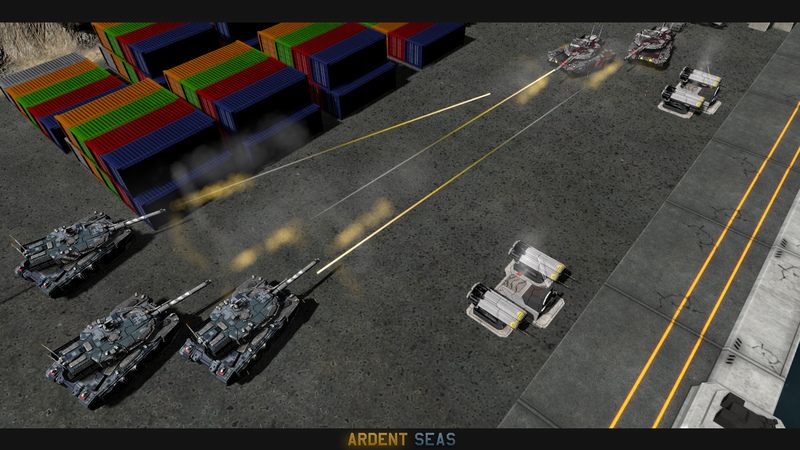 Ground Combat would require the island to be designed with it in mind, require a few new mechanics, and so on. We could add it after the initial release, but it would feel tacked on, and require the remodeling of most islands. That’s why we want to include it in the KS campaign. Next up, there are a few gameplay changes and additions, which have nothing to do with the kickstarter campaign. These mostly are with regards to the TDN. First of, the way CIWS – Close-In Weapon Systems – work for the TDN has been change so that instead of throwing missiles around with their RAM launchers, they have few RAM launchers, and several CIWS guns, like Phalanx or Goalkeeper, on their ships, creating two layers of defense. The first being the RAM launchers, which can intercept missiles at quite some range, and the second the CIWS guns, which shred any missiles coming through the first layer. 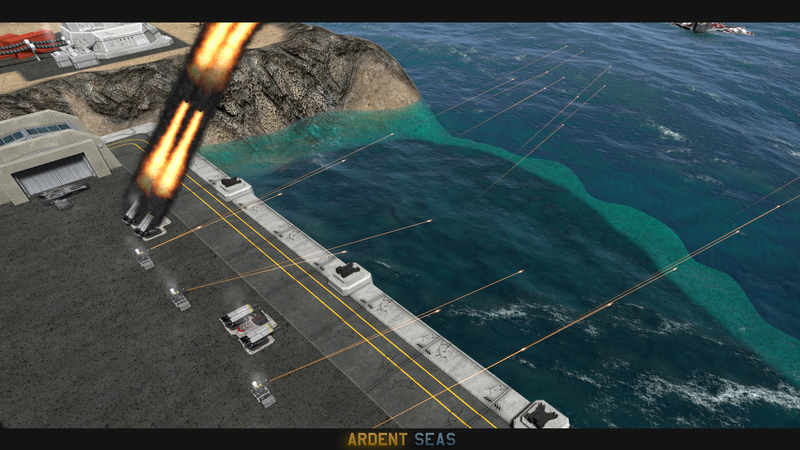 If you plan to kill a TDN ships with missiles, be prepared to bring a LOT of them. 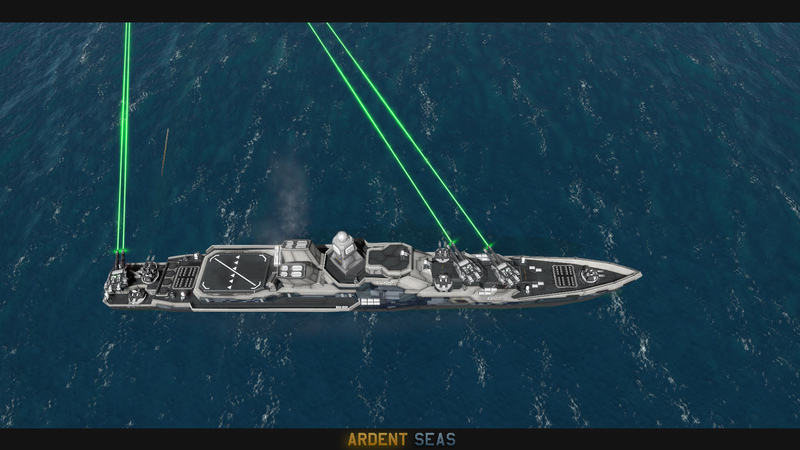 The CIWS guns can be upgraded to lasers. 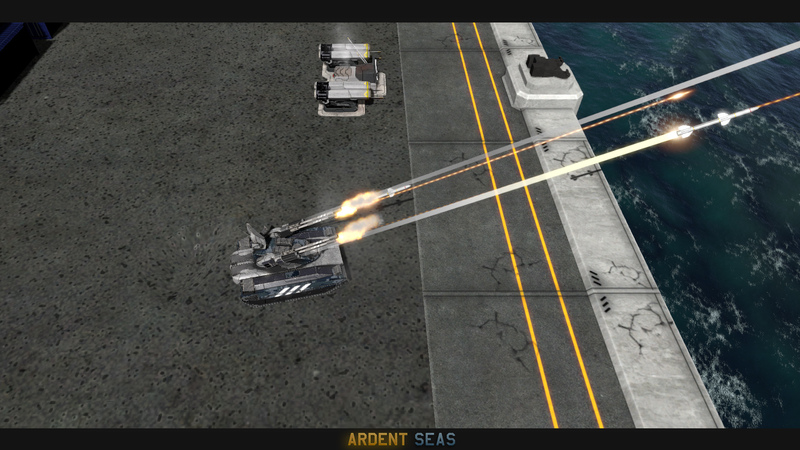 Next up, things like the Cruiser weren’t supposed to get beam weapon upgrades initially. That is no longer the case. They get fricken lazors now. These are called Refractor Lasers. 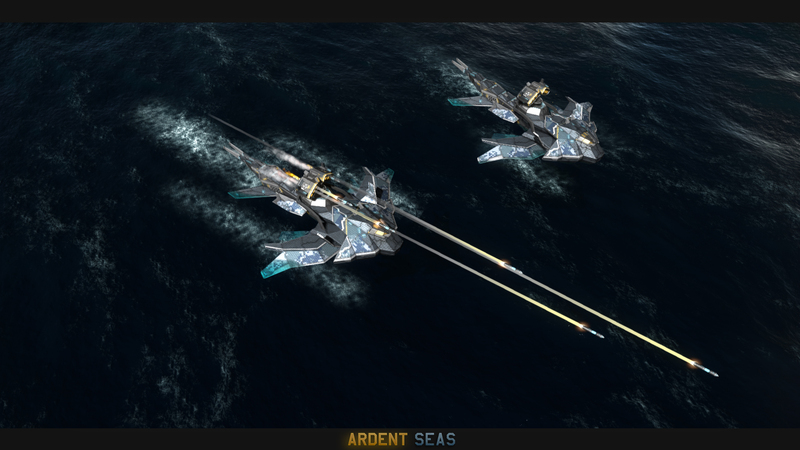 They can refract off of a target into many directions, damaging any nearby enemies. 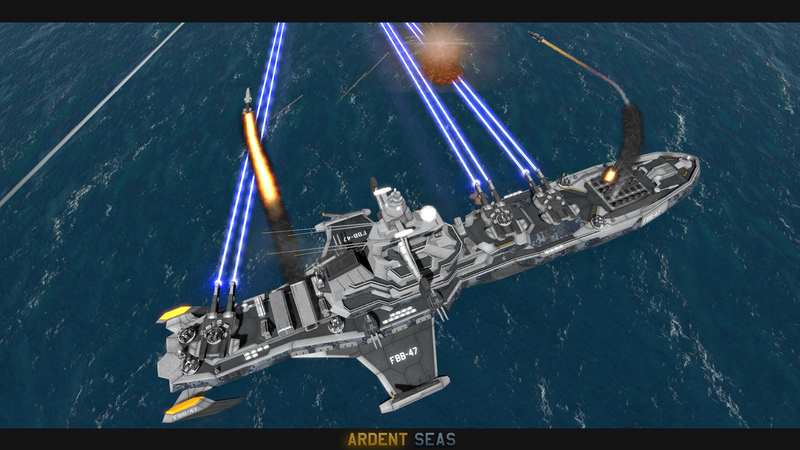 The Battleship is also affected by this upgrade. This mechanic doesn’t actually work yet, they can hit targets, but the refractor part isn’t functional at this time. 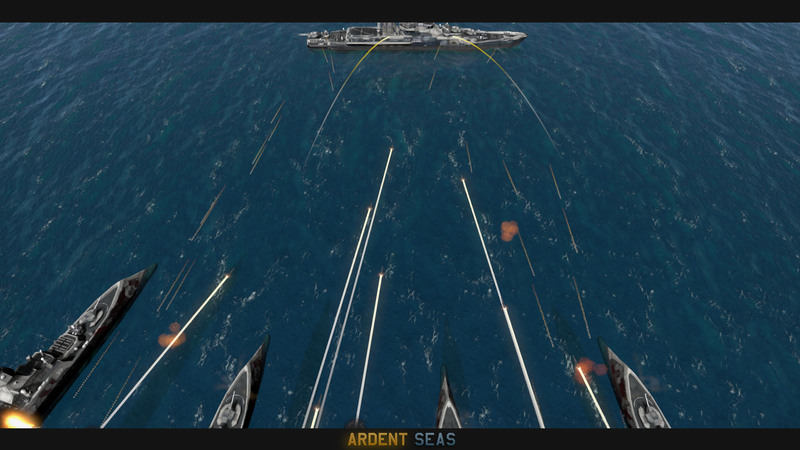 The lasers are color-coded, green is against aircraft, blue against surface targets, and red against missiles..
Next, let’s take a look at the Coalition Navy. 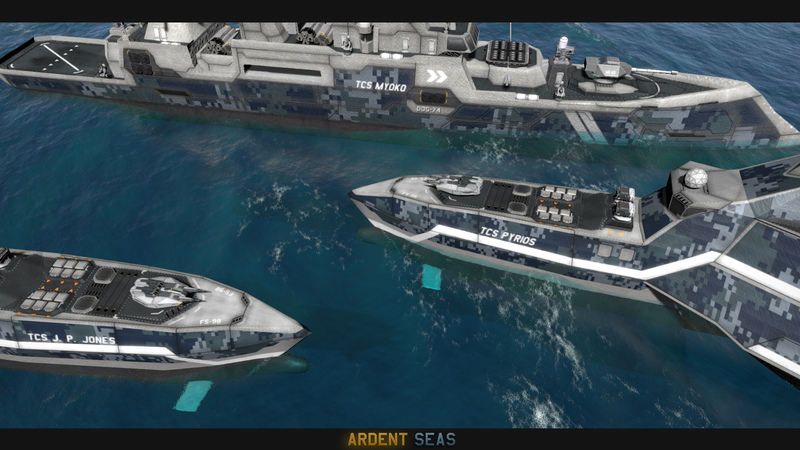 In between finishing most of the Tenorran Defense Navy’s units, I’ve created the first 3 CN units. 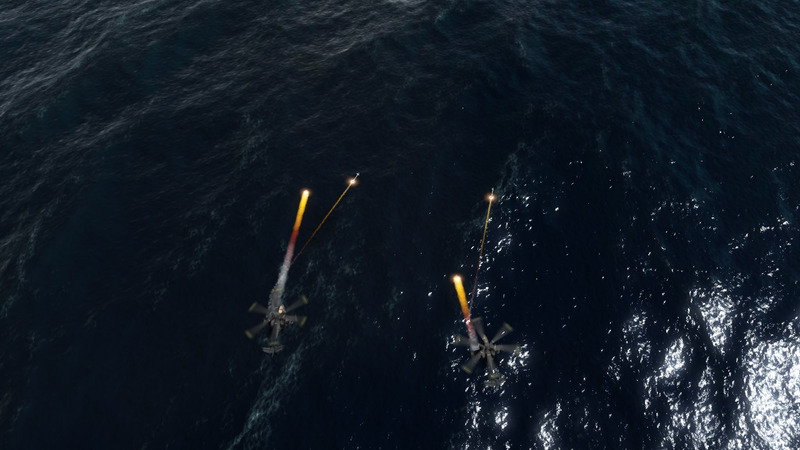 The Cassowary attack helicopter, the Mako fast attack ekranoplan, and the Assault Destroyer. The Cassowary is a heavy attack helicopter, armed to the teeth, and able to withstand quite a bit of punishment. It’s speed and flight range are limited, though. 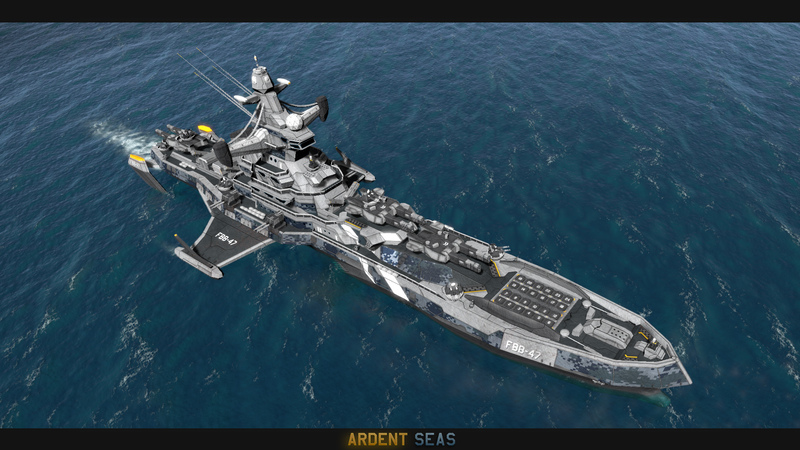 It can either carry an anti-ground loadout, to attack structures and such, or an anti-ship loadout, with 8 heavy anti-ship missiles. 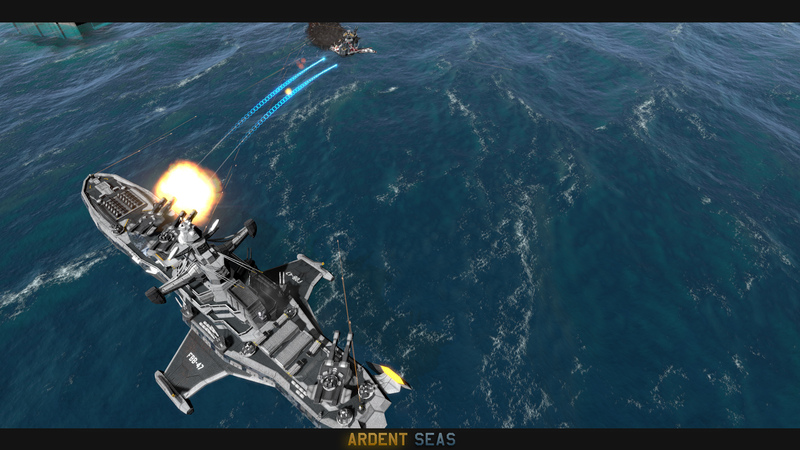 The Assault Destroyer is a heavy warship, armed with 2 big quad cannon turrets and 2 heavy missile launchers. It’s very heavily armored, but not very fast, and lacking in the attack range department. That being said, it is more than capable of holding its own in any engagement. In contrast to the Assault Destroyer, the Mako is a fast ekranoplan, also armed with the same kind of missile, but basically unarmored. 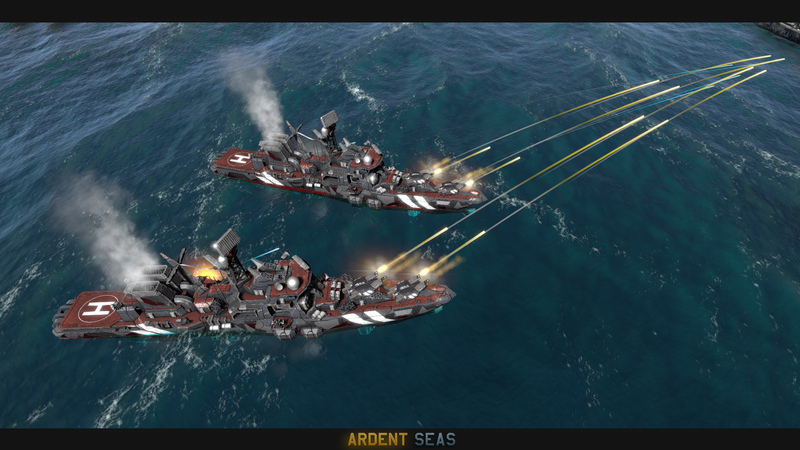 It’s an early-game unit, great at harassing the enemy early on, as well as distracting enemies to allow your destroyers to get into range. 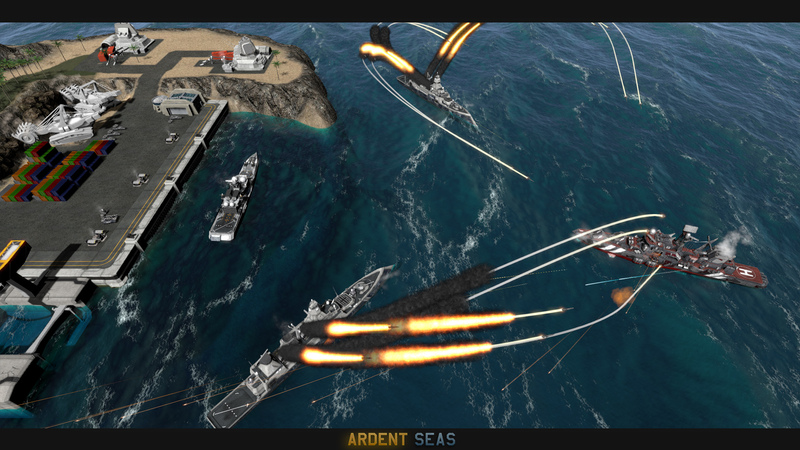 Moving on to the Tenorran Defense Navy. 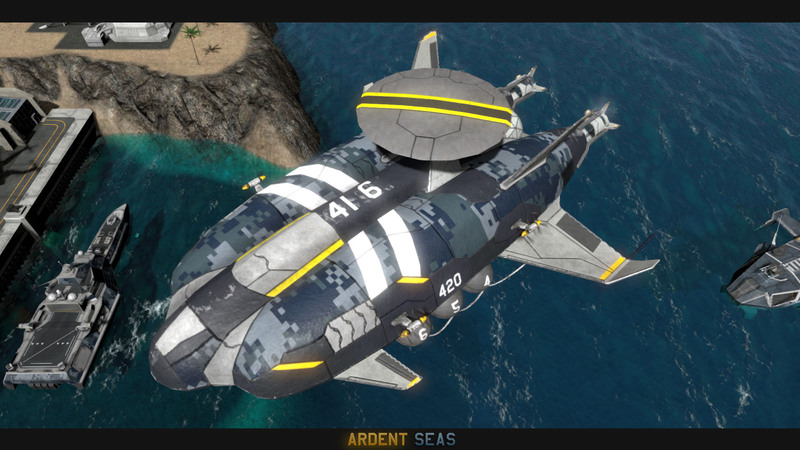 In a previous update, we’ve shown two work-in-progress units, the Battlecruiser and the Helicopter Cruiser. We’ll start with those, and then move on to their other new, and improved, units. The Battlecruiser is a long-range anti-capital ship…ship, it fires hypersonic and supersonic missiles, these are very fast, and quite devastating, but they aren’t incredibly accurate or nimble, and will thus miss smaller ships most of the time. 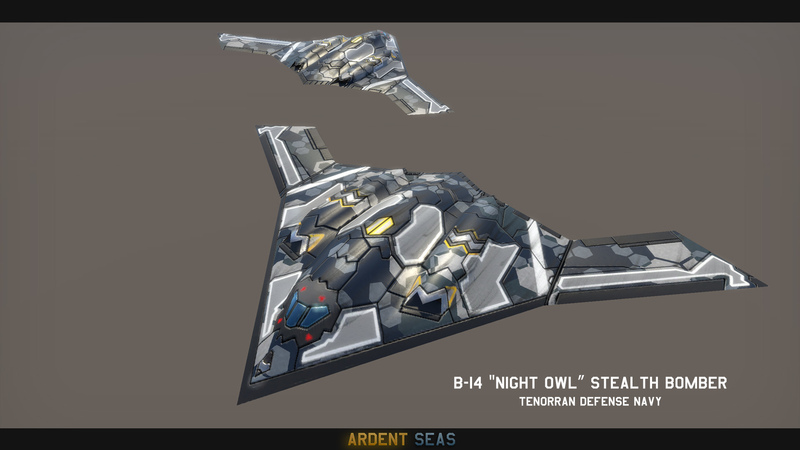 While it can fend off small ships, it’s very weakly armored for such a large ship, and requires protection. It should be kept away from the front lines if possible, and fight in a supporting role. 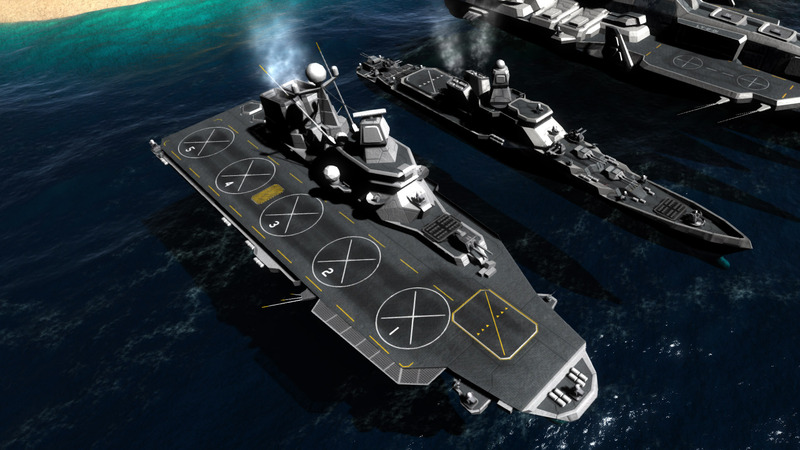 The Helicopter Cruiser is basically a cruiser-sized aircraft carrier. 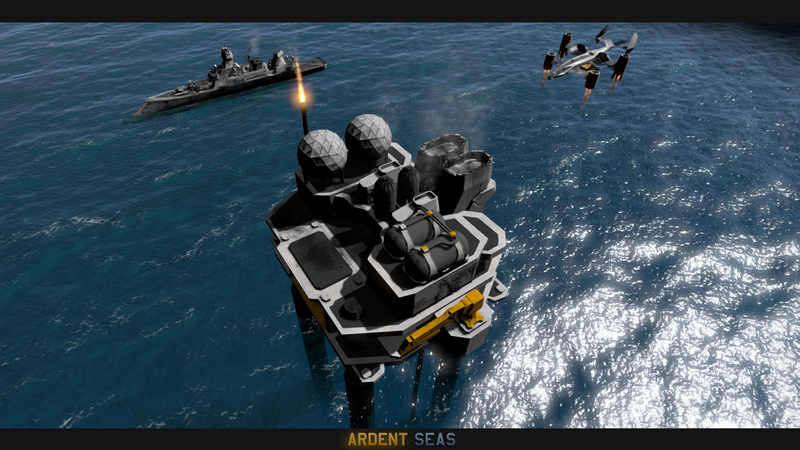 It can’t produce aircraft by itself, it’s more of a floating support airfield. It rearms, refuels and repairs any aircraft stationed on it. 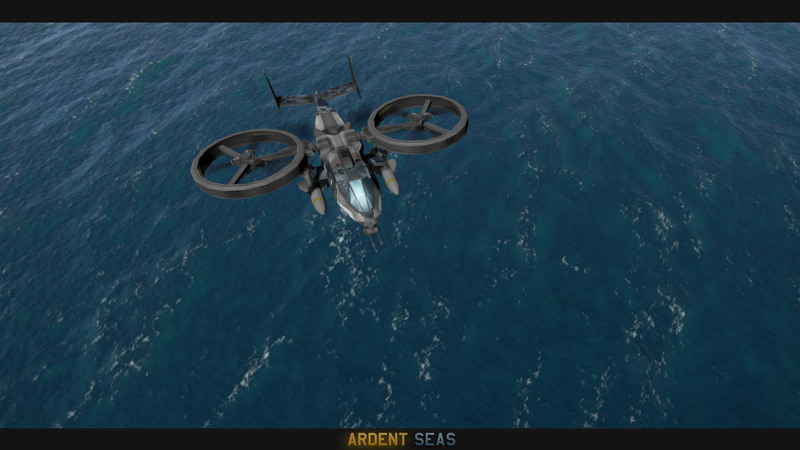 Unlike the Flagship and the Supercarrier, it is limited to VTOL aircraft, and is best used to support things like the Wyvern gunship. 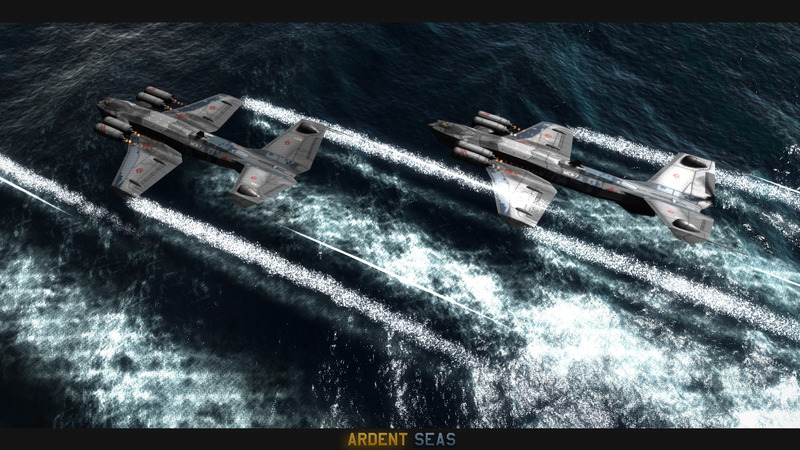 Next up, we have a few new TDN aircraft: the Fighter-Bomber, the Stealth-Bomber, the Support Airship, and the Anti-Submarine helicopter. 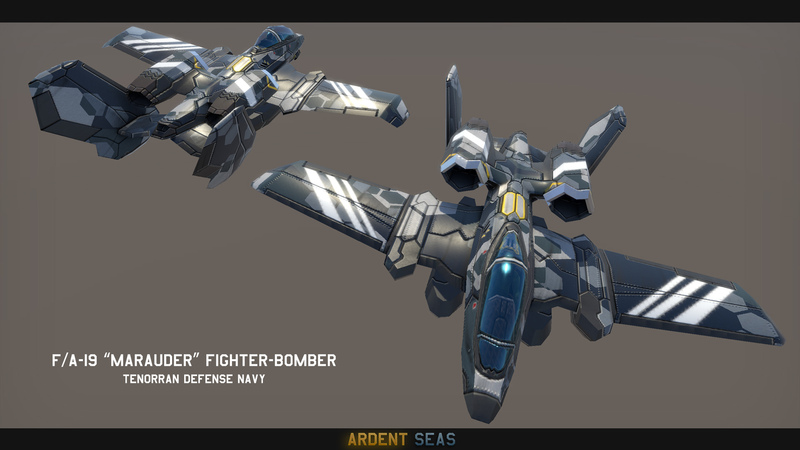 The Fighter-Bomber is built to fight against heavy ships, and can take quite a lot of punishment, and carries a boat load of countermeasures, like flares and chaff. It’s armed with anti-ship missiles and a heavy chem-rail cannon. The Stealth Bomber is self-explanatory. It’s an aircraft invisible to the enemy until it launches its bombs, or is being detected by more advanced radar systems. It’s best used to attack island installations. The Support Airship is a flying AWACS and Refueling station at the same time. 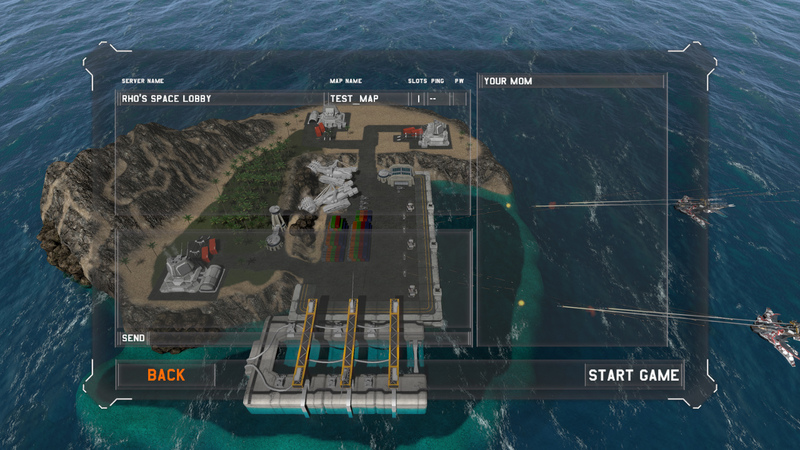 It reveals enemies in a large area, and can refuel friendly aircraft. If an aircraft still has ammo left, but is low on fuel, it can refuel here rather than flying back to its carrier or airfield, without putting a carrier in harm’s way. 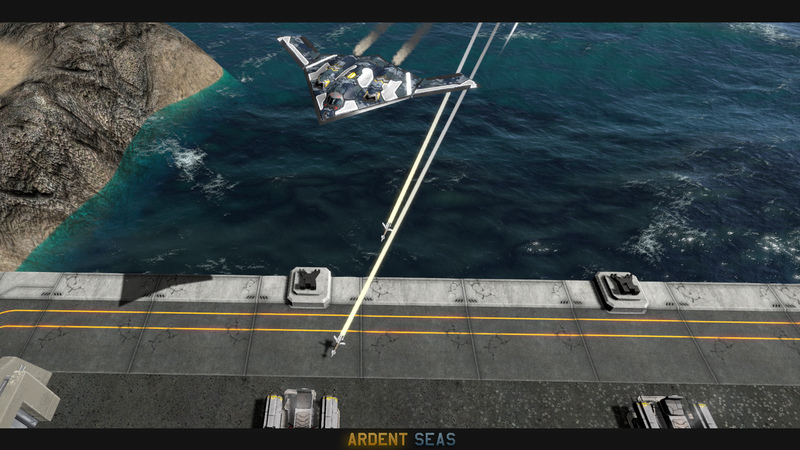 The Anti-Submarine helicopter is, once again, self-explanatory. It’s a helicopter that can detect and attack submarines beneath the waves. Furthermore, the TDN have several structures now. Some of the first screenshots already showed off some of the smaller structures, and I’d like to go into more detail about those here. 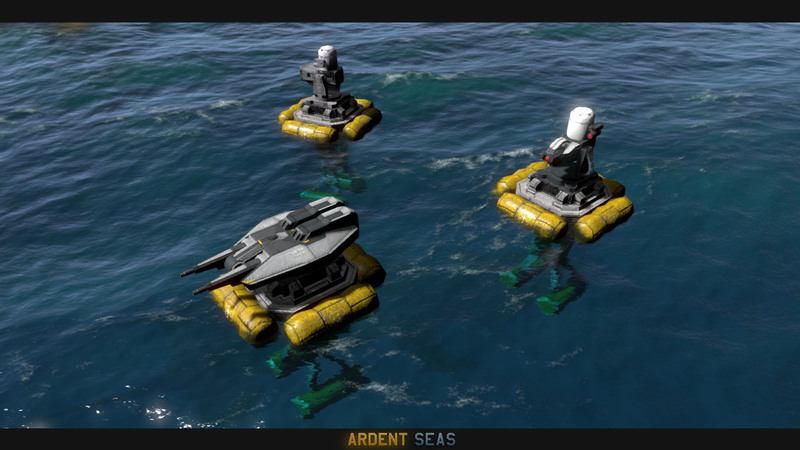 Additionally, they can build small, floating platforms with a variety of small weapons, including CIWS guns and launchers. 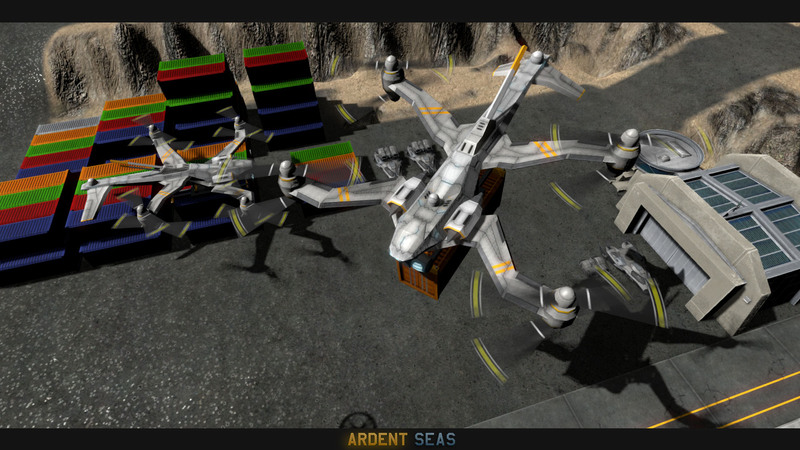 They have a mining platform now, although the texture still needs a lot of work. 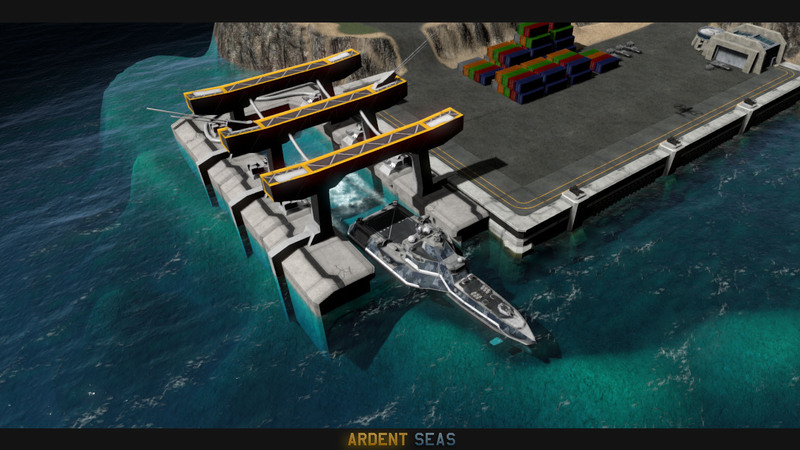 The Battleship has new textures, and also they have their Small Shipyard now. The Ravagers got the short end of the stick this time around, with only one new unit. With the TDN now almost finished, you can expect a lot more new Ravager units in the future. I am working on one, but their unusual designs do make it more challenging than I first thought. 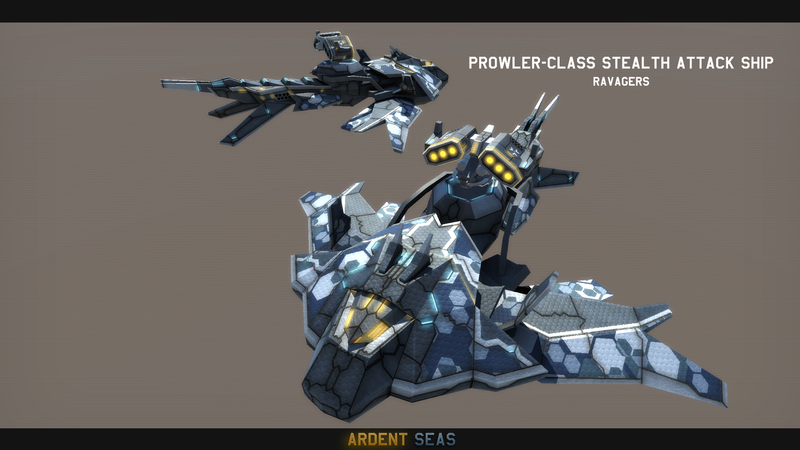 The new unit is the Prowler. A stealth attack ships, it uses a stealth field generator to conceal itself from the enemy, It’s armed with an enormous missile launcher, usually reserved for their large and capital ships. 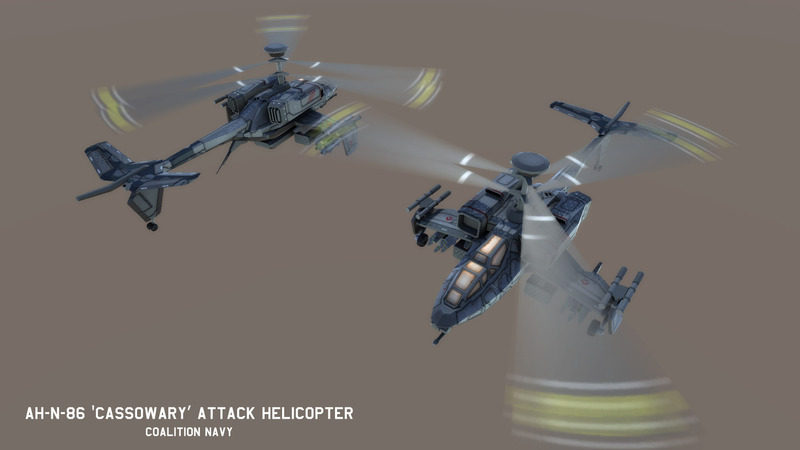 The unit I’m working on right now is called the Stalker, another stealth unit, but the Stalker is a stealth artillery, that does become visible when it moves, unlike the Prowler, which is always stealthed, until it fires its missiles or if it gets too close to an enemy. 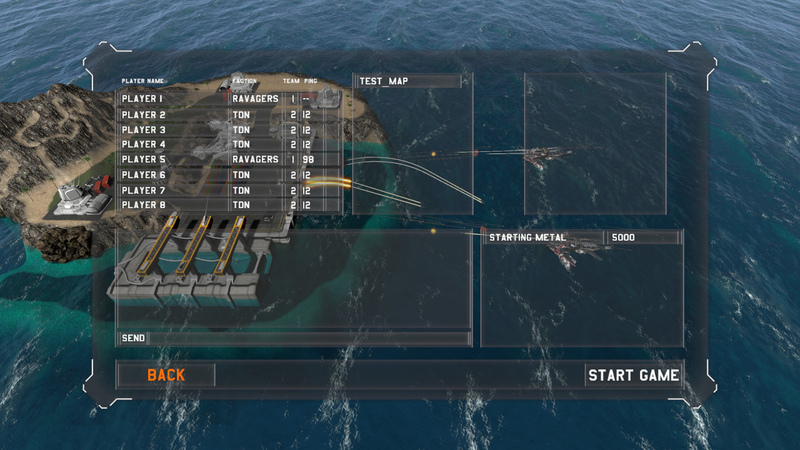 Lastly we have some previews of the UI, and some gameplay footage as well.